Preparation and planning are the name of the game when it comes to meals in our kitchen, especially now that I’m back at work. I’ve always been committed to weekly meal planning and trying to create a menu that works with our schedule, but it’s become all the more important. Meals that I can either make ahead of time or in minimal time on a weeknight are my go to for now, and I’ll likely devote a few hours each weekend to getting a head start on cooking. This Spring Panzanella salad isn’t a true make ahead meal, but most of the components can be made ahead of time, leaving you to quickly toss them together and eat when you’re ready! 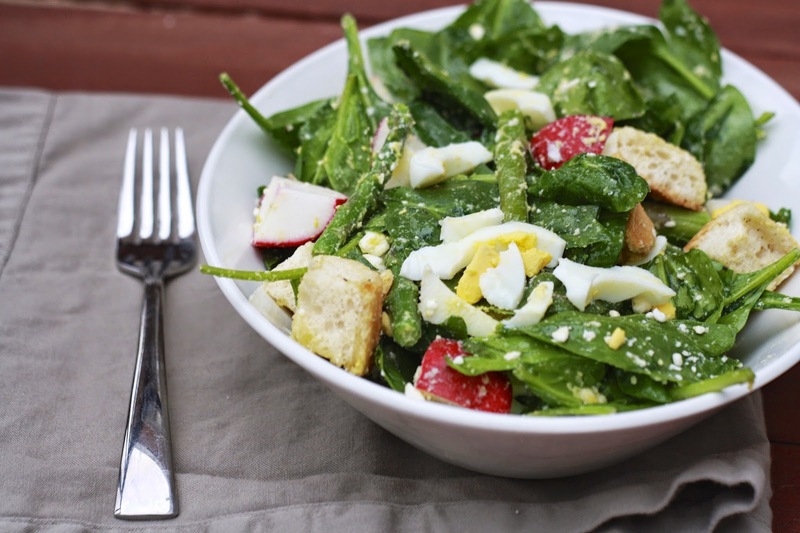 I was still on maternity leave when I made this, but I still followed this system, cooking the asparagus, hard boiling the eggs, toasting the croutons, and making the dressing. When we were ready to eat, it took no more than 5 minutes to finish and get dinner on the table….pretty ideal if you ask me! I love a good panzanella salad (check out the Greek Panzanella and the Panzanella Caprese in the archives) and this one was no exception! 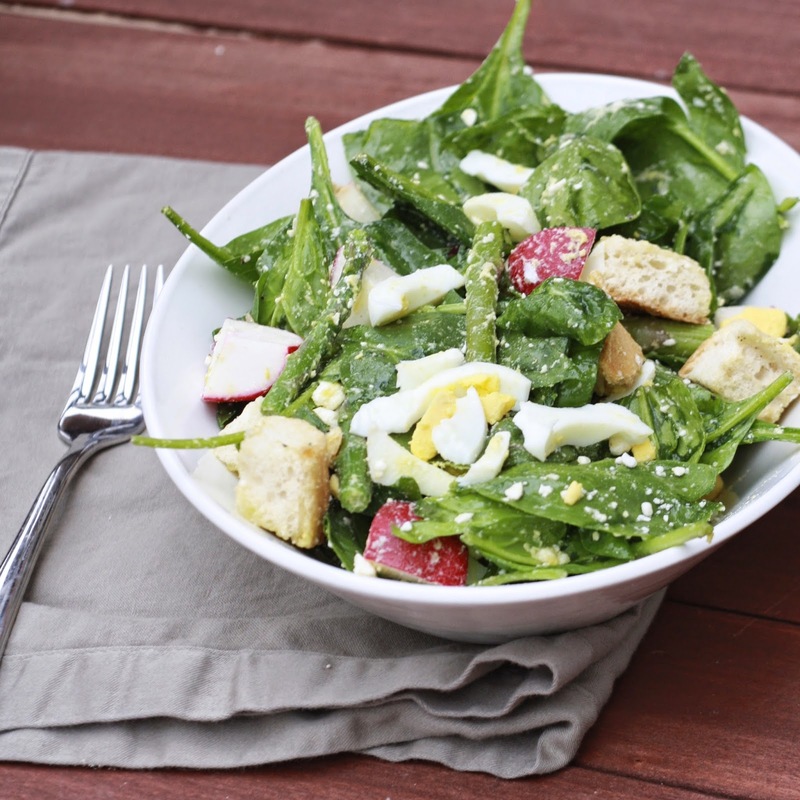 To make it even easier, skip the hard-boiled eggs and instead top with chicken or chickpeas or your protein of choice! Help me out—what are your favorite make ahead meals? 1. Preheat the oven to 350F. Place the bread cubes on a baking sheet and brush lightly with olive oil. Sprinkle with salt and pepper. Bake for approximately 12 minutes, until crisp. Remove from oven and set aside. 2. Place asparagus in a large pot of boiling salted water. Cook for about 3 minutes, just until tender. Drain, cool, and set aside. 3. In a small bowl, combine 1/4 cup plus 2 tbsp of oil with the red wine vinegar. Season with salt and pepper. 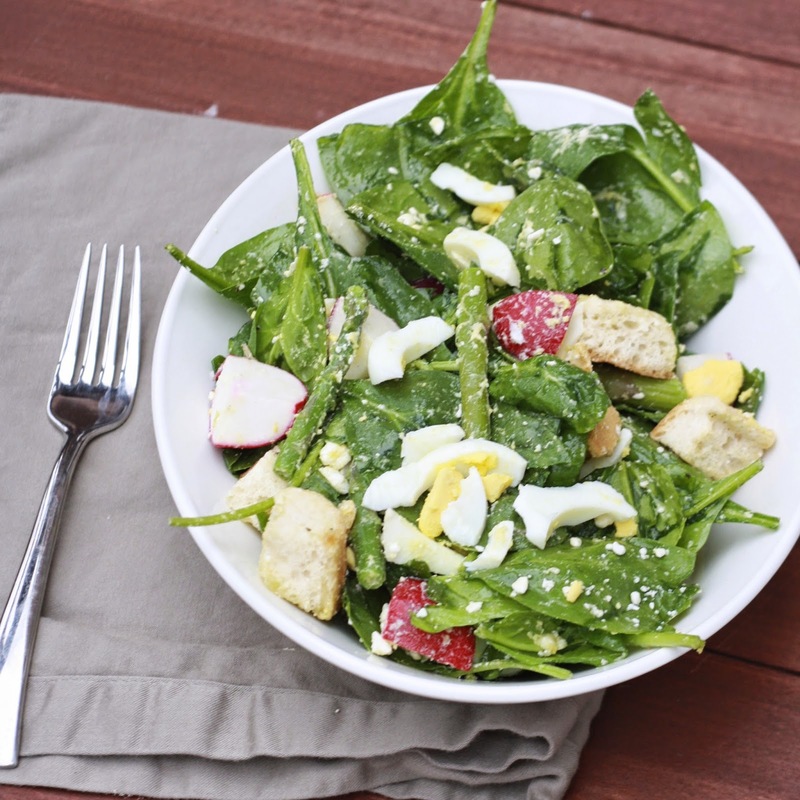 In a large bowl, toss the asparagus, bread cubes, spinach, onion, hardboiled eggs, radishes, and feta with the dressing. Serve immediately.